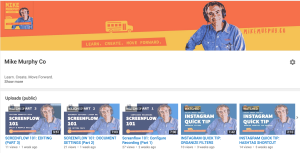 Screenflow by Telestream is how I make tutorials and Screencast videos on my Mac. If you are on a Windows PC, try Camtasia. The following three videos should get you up and running using Screenflow. There are a lot of bells and whistles in Screenflow, but learn the basics first. It’s a bit confusing at first, but once you get the big picture, it’s a piece of cake. Tip: Always make sure your Screenflow is sized to 1920x1080 (or 1280 x 720) if you are on a Retina display. I made my first Skillshare class all sized to my Retina display of 2800 x1800 and had to resize it all after I was done editing! Don’t forget this step. Hopefully future versions will address this. This is an intro to Screenflow. How to Configure Recording and record a simple Keynote presentation with voiceover. This tutorial does not cover editing in Screenflow. Learn how to zoom in on tracks and the stage. Learn the most powerful keyboard shortcuts and techniques for editing in Screenflow: Split Clips, Ripple Delete & Ripple Insert.Once I learned these in Screenflow, everything got easier. The editing techniques in this tutorial is how I edit 99% of all my videos in Screenflow. Get notified for each new video by subscribing to Mike Murphy Co YouTube Channel. Questions? What Tutorials Do You Want Me To Make?